I do not even want to mention how many times I have made these brownies since my Mum sent me the recipe. I know I always talk about amazing brownies, but these truly are. SIDE NOTE: Regular scheduled posting? What is that? I may return to it sometime soon. When served warm, they are soft, gooey and the sweet caramel is piping hot and contrasts with the rich brownie. 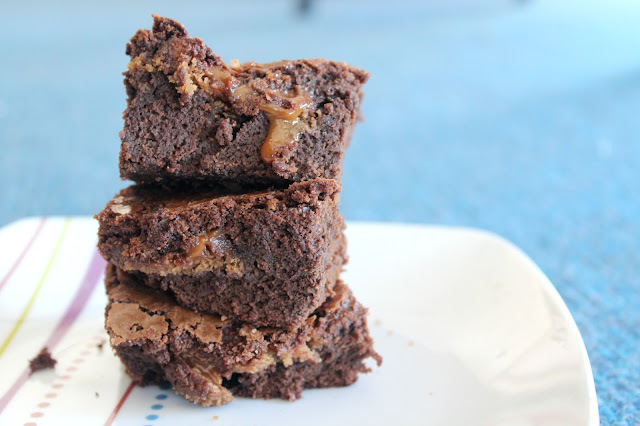 When served cold, the caramel biscuits are more obvious (the biscuit has not melted into the brownie base as when they are hot). 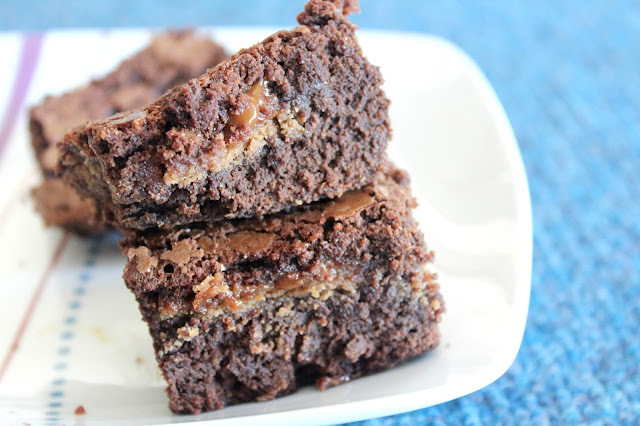 You can taste the rich brownie, the caramel is chewy and the biscuit hard and crunchy. The texture of the biscuit is a little disconcerting but not terrible. I personally prefer to serve them warm, as I love the melted caramel and lack of biscuit crunch. 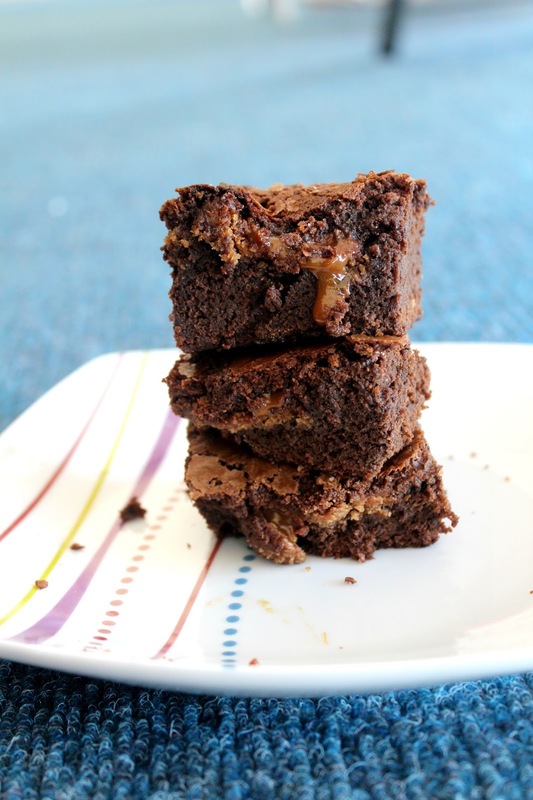 Remember, if you are serving the brownies warm, if you reheat them in the microwave, wait a moment before serving because the caramel will burn your tongue. I'd advise reheating in the oven, because, as usual, reheating in the oven makes the food taste better. This is not my recipe. I have copied it below exactly as it appeared in the June 2013 issue of Australian Good Taste. Preheat the oven to 160 degrees Celsius. Grease and line with baking paper a regular sized brownie tray. In a large bowl melt the chocolate and butter together. In a smaller bowl, whisk the eggs and egg yolk together until well combined. Add the eggs to the chocolate mixture and stir with a wooden spoon until well combined. Stir in the sugar. Sift in the flour and cocoa powder and stir in with the wooden spoon. Pour half the brownie mixture into the pan. Spread the biscuits (should be 12) evenly on the brownie base. Press them down into the mixture. Pour the remaining brownie batter over the top and spread evenly with a spatula so the surface is smooth. Bake for 40 minutes. Set aside to cool slightly and serve warm. Haha well you should definitely get her to make them for you. They are fantastic! 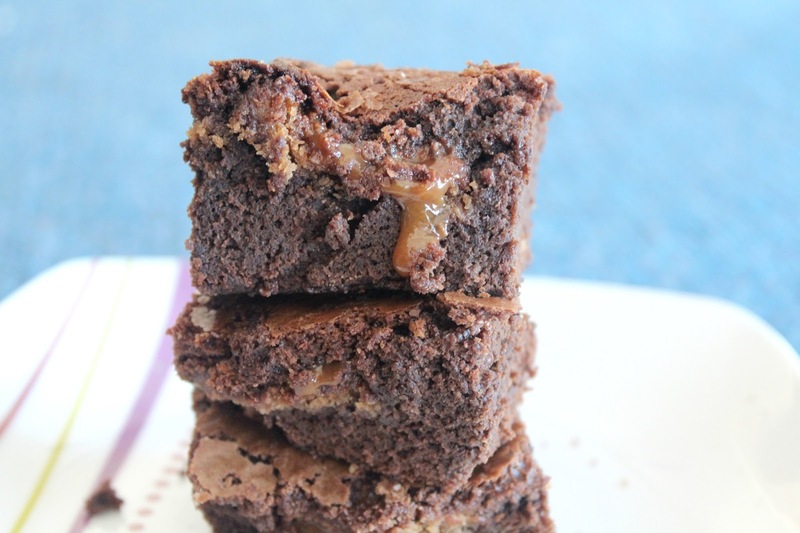 That gooey caramel on top looks to die for. Great photography! Thanks Madison! The caramel is the best bit.